The porous polymer coating reflects sunlight and emits heat to passively cool off buildings. Credit: Jyotirmoy Mandal/Columbia Engineering. Heat-waves are on the rise all over the world, becoming more frequent and more intense. Developing countries are the hardest hit: not only are heat waves more extreme than in other parts of the world but cooling methods are also more difficult to implement due to cost. In such situations, passive cooling — which doesn’t require electricity or any kind of energy input — is the way to go. Plastics and other cheap polymers are actually excellent heat radiators, which would make them ideal for passive daytime radiative cooling (PDRC) if scientists could figure out how to get these normally transparent surfaces to reflect sunlight without using silver mirrors. Researchers at Columbia University have finally been able to accomplish this. 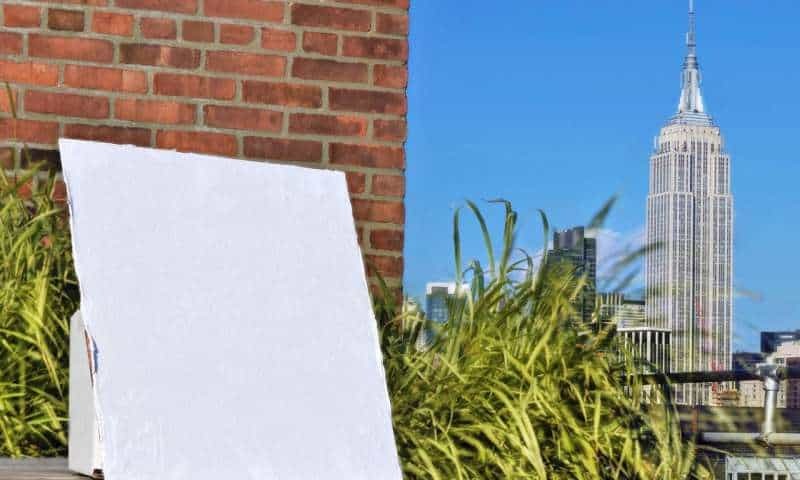 Reporting in the journal Science, the authors described a PDRC polymer coating with nano- and micro-scale voids that act as passive air coolers. The amazing part is that the coating can be applied like paint on rooftops, buildings, vehicles — basically anything. A passive cooling surface is effective when it has a high solar reflectance and emittance. In other words, if these two variables are high enough, there’s a net heat loss effect ever under intense sunlight. The cheapest and, often times, most practical PDRC is white paint. If you’ve ever switched a black shirt for a white shirt on a hot summer day, you must know how much of a difference this can make. The problem with white paint, however, is that it doesn’t reflect longer wavelengths of light, so its cooling performance is modest. 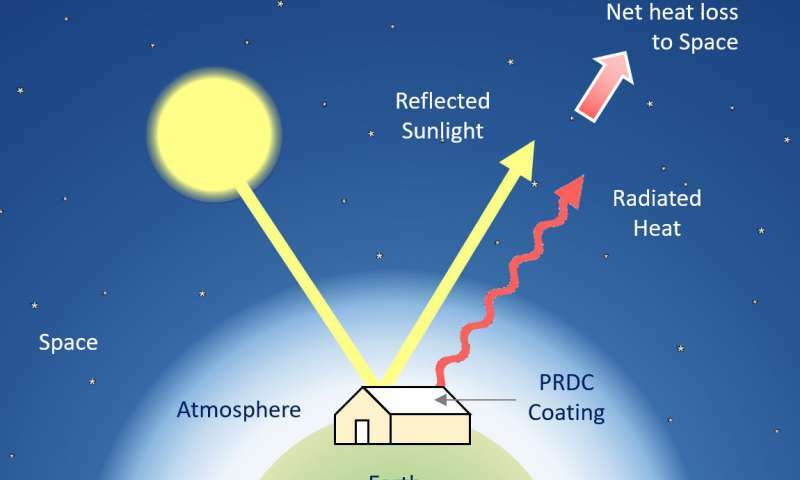 Passive daytime radiative cooling (PDRC) works by reflecting sunlight and emitting heat in order to achieve a net heat loss. This way, a surface can attain sub-ambient temperatures. Credit: Jyotirmoy Mandal. Using phase-inversion, the Columbia Engineering team was able to introduce light-scattering air-voids in polymers. The process involved mixing the polymer with a solvent alongside water, in which the polymer is insoluble. Ultimately, the pigments in white paint were replaced with air voids that reflect all wavelengths of light, from UV to infrared. And even though there were no pigments, the polymer still turned white. What you get is a far better performance than typical white paint and even better than some state-of-the-art PDRCs that are complex and costly. What’s more, there’s the convenience that the polymer coating can be applied like paint to virtually any surface. During tests, the coating kept surfaces significantly cooler than the surrounding environment under widely different skies. For instance, the polymer paint cooled surfaces by 6°C in the warm, arid desert in Arizona and 3°C in the foggy, tropical environment of Bangladesh. Another selling point is stability. For instance, cellulose, which is the main component of paper, turns yellow over time. The porous films developed at Columbia, however, did not seem to change one bit over the course of a month in the field. “The fact that cooling is achieved in both desert and tropical climates, without any thermal protection or shielding, demonstrates the utility of our design wherever cooling is required,” Yuan Yang, assistant professor of materials science and engineering, said in a statement. Until not too long ago, white was thought to be the most challenging color to manufacture. The new research, however, shows that, in fact, white can be the most attainable color. “It can be made using nothing more than properly sized air voids embedded in a transparent medium. Air voids are what make snow white and Saharan silver ants silvery,” Nanfang Yu, associate professor of applied physics said in a statement.